To climb a tree using a rope, a way is needed to get the rope up very high over a selected branch. The solution most often used is to use a big sling shot to launch a small weighted bag, called a throw-bag, over the branch. The throw-bag is attached to a light-weight string about the size of a kite string, so as the bag sails over the branch, it drags the string along with it and falls back down to the ground. The string is then attached to the climbing rope and used to pull the rope over the branch. It is a simple concept that sometimes proves to be difficult in practice. 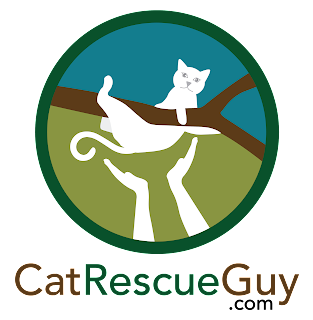 Ideally, for any rescue, I should be able to shoot the throw-bag into the tree over my selected branch one time and proceed with installing the rope, and most of the time that is exactly what happens. Sometimes, my aim may be off, or the throw-bag may get stuck, and I have to shoot it a second time. On bad days, I may have to shoot it a third or fourth or maybe even a fifth time. This background information is key to understanding why Lucy's rescue was so troublesome. Lucy had been stuck in a tree for five days by the time Roxanne discovered her on her property in Abbeville and found me. Lucy belonged to a neighbor, but Roxanne was the one who found help by posting a plea on Facebook. Someone who knew about me connected us together, and I went out there the following day, Lucy's sixth day in the tree. Lucy was about 40 feet high in a large, scaly-bark pine tree. She was comfortably perched at the point where the trunk split into smaller stems as indicated in the picture by the red circle. Close below her was a large branch that reached over the nearby power lines. Lucy's owner described her to me as "very skittish," and that was a big concern for me. I was worried that she would get away from me by walking out on the branch over the power lines. To prevent that problem, I wanted to set my rope on that side of the tree to discourage her from going in that direction. With the power lines there, I was limited in the direction I could shoot my throw-bag into the tree. I could not shoot it toward the power lines, but the lines were too close to allow me to shoot away from them either. I could shoot the throw-bag only parallel to the power lines. Still, this tree had enough substantial branches that I should be able to find a suitable branch. I shot my throw-bag into the tree, but, my aim was slightly off, and the string was too far out on the branch to be usable. I pulled the string back out and shot it again. Now, at this point my memory gets very hazy, because it turned out that I had to shoot my throw-bag into the tree so many times that I lost count. It felt like a dozen times but may been only ten. Each attempt except the last resulted in a throw-bag that would not fall to the ground because the string got stuck under the scaly bark even when I switched to heavier throw-bags. After each unsuccessful shot, I would have to spend a few minutes feeding all the string back into its container before the next shot. However, most of the times I shot my throw-bag into the tree, Lucy was frightened by it and reacted by going down the tree a little bit. She jumped down to the nearest branch and perched there until the next shot which caused her to jump down to the next branch. Each time she went lower, I changed my target branch to put myself in a better position to rescue her. 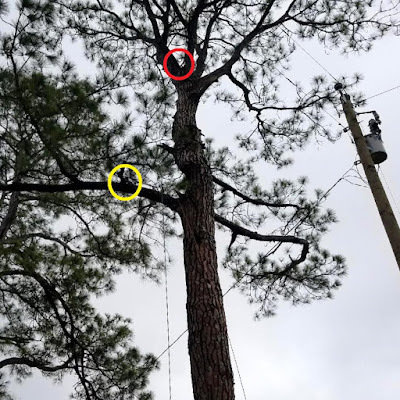 She eventually ended up on the lowest branch (indicated by the yellow circle in the picture) but was still about 25 feet high. On this lowest branch, she seemed to settle in, and by this time, I had successfully shot my throw-bag into the tree and began installing my rope. Strangely, Lucy appeared not to be disturbed by the activity of installing my rope, even though the throw-bag and rope were now passing closer to her than any time before. She remained in place on that branch even though it was very long, level and large enough that she could have easily gotten away from it. It appeared highly unlikely that she could be scared down from there, so I finished installing my rope and began to get ready to climb. While I was putting on my climbing gear, I happened to be on the opposite side of the tree from her where we could not see each other. As I was bent over putting a piece of gear on my foot, I heard the sound of claws scratching on bark. Then I heard Roxanne say something about Lucy coming down. I could not see how it happened, but Roxanne told me that Lucy began climbing down backwards but fell when she got about halfway down. I saw Lucy as she ran off across the street to her familiar hang-out and out of sight. She appeared to be fine. I stood there for a moment feeling glad that Lucy was down but aggravated that I had just spent an hour and a half setting up to climb the tree and now there was no need to climb. I was tempted to climb the tree anyway just so all the setup time would not feel so wasted. Instead, I began to pack up, ready to put this successful but unsatisfying rescue behind me. I never got a single picture or any video of Lucy. Fortunately, Roxanne came to my rescue with a picture of the tree, and I am using a generic picture of some other tortie cat to represent Lucy. I don't know what she really looked like. 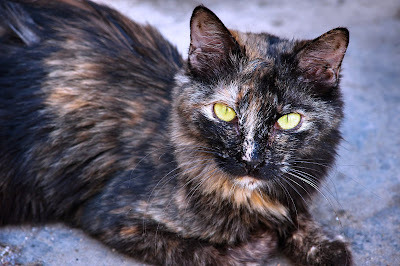 In fact, I am not even sure she is a tortie, since I never got a good look at her. Oh well. Some rescues are like this. The main thing is that Lucy is back down on the ground again. And now that I have had time to think about it, it is a good thing that I had all that trouble, since that is what caused her to rescue herself.